Pedestrians must cross streets on pedestrian crossing. This rules apply everywhere, almost all countries have the same rules. Indonesia is no difference. Pedestrian must walk on either zebra crossing or crosswalks whenever they want to make a cross. Also, no doubt that Indonesians have been taught about this since they are in kindergarten. Unfortunately, many times, life doesn’t go as theory says. Like the above picture, could you tell me what a pedestrian should do to make a pass to the other end of the street? The traffic light signed that it was pedestrians’ turn to use the street and they must reach to the other end before the light changed and prohibit them to make a cross. How could they do without breaking the pedestrian law? 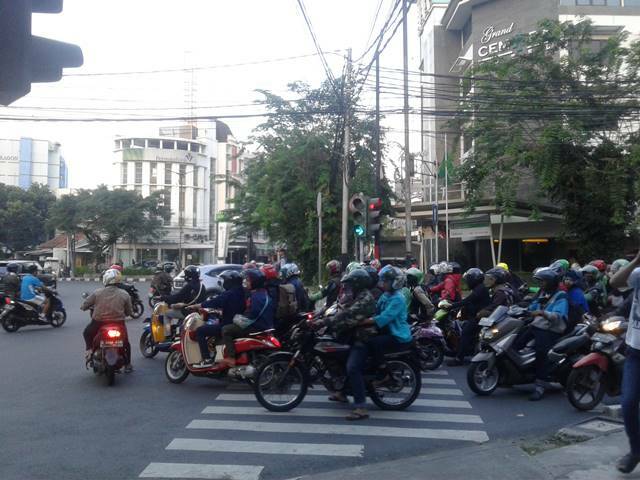 This is the type of daily event in Jakarta, the Capital of Indonesia that vehicles blocks pedestrian crossings while waiting for a traffic light to change. Many times, pedestrians can’t properly make a pass without breaking a law. Definitely, they don’t intentionally break it, they are forced to as there is no other way to make a cross without walking out from the crossing lane and walking zig-zag-ly between narrow gap between motorcycles or vehicles. If you have any better solutions, for us, pedestrians to utilize properly the pedestrian crossing, please do let me know. I am sure many pedestrians will be more than happy to listen. However, please don’t tell us that this is the police officers or government duty because many times, even there are police officers , the same condition and situation still occurs. Unfortunately also, the event can be found not only in Jakarta but also many other cities in Indonesia. Previous articleCharacteristics of Balinese Dance: Dynamic, Very!